Focusing a telescope is a fundamental task for astro-photographic imaging. Maintaining best focus is crucial but over time load transfers due to the mount motion as well as changing temperature often cause a significant change in focus, see our eduction “how much focus error is too much?” page for further information on this matter. Advanced scope designs, such as Ritchey-Chretien (RCT), are even more challenging on that matter. RCTs can deliver amazingly sharp images, but they may exhibit significant astigmatism even inside the critical focus zone, therefore they must be at best focus all the time. A less known and subtle focus problem can be traced from temperature gradients inside mirrors, as well as differential thermal inertia between secondary and primary mirrors. These types of issues are not easy to solve leading eventually to recurrent refocus interruptions. Imaging software packages typically allow for periodic refocusing. The classical procedure calls for slewing the scope toward a bright enough reference star, then running an autofocus (AF) utility, such as a V curve focusing algorithm, and finally reacquiring the target. This is, at best, a time consuming procedure during which you are no longer imaging your target. It can also result in additional problems if the mount is unsuccessful at accurately reacquiring the target after the focus routine. As a general rule, every time you move away from your target, you not only lose precious imaging time but you also open the door for problems. It is quite common to find that the first frames after the target reacquisition have a poor FWHM due to the mechanical settling time linked to slewing. Our patent pending SharpLock technology provides better and unique way to deal with focus changes using a true Real Time Auto Focus (RTAF) solution. SharpLock continually monitors and maintains critical focus without any interruptions in imaging operations. There is no longer any need to slew the scope for refocusing. Unlike traditional auto-focus software looking at the size of the star for focusing using a V curve approach, SharpLock uses the shape of the star instead. SharpLock retrieves both, the focus quality and the focuser move (direction and amplitude), if any, to improve the focus. All of this while you image your target. Recognizing that high performance astrographs and large CCD chips require an even more accurate focus, we have developed a new solution for providing real time autofocus (RTAF) operation while guiding with an ONAG®. This breakthrough technology is named SharpLock and it provides RTAF using the guide star during normal imaging of the target object. Any RTAF system needs information not only about the quality of the focus (such as FWHM or HFD) but also in which direction the focuser mechanism should move to achieve focus. Unlike conventional AF software, SharpLock’s advanced algorithms analyze each guide star image as it comes in, as well as their history, evaluating focus quality, and determining the required focus correction without actually having to move the focuser. 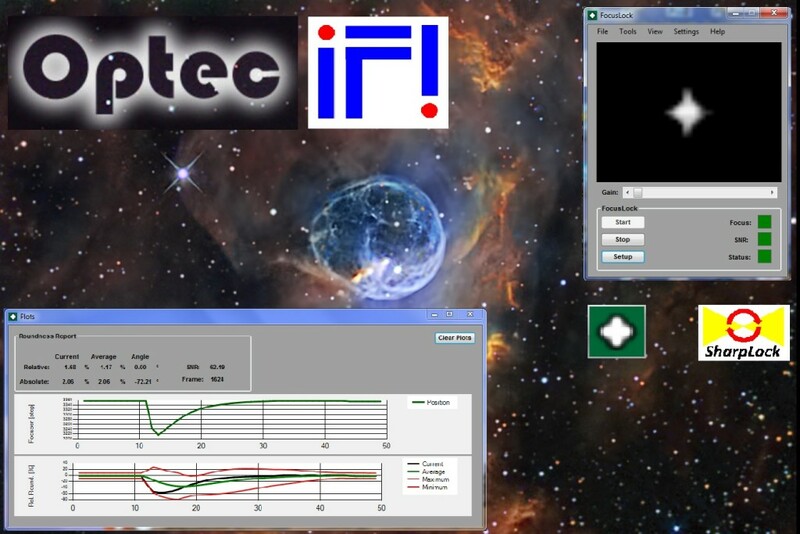 When a focus correction is required, if any, the controller computes the necessary focuser motion (how many steps and in which direction) and provides real time autofocus capability. The SharpLock solution keeps your system at best focus every time, all the time, efficiently integrating two crucial tasks for astrophotography: Guiding and focusing. The auto-guiding and therefore RTAF rate is typically between 1 to 30 seconds depending on the guide exposure settings. AF corrections at such rates are very small (a few microns) and the required focus correction does not impact image quality. In fact, any movement caused by the focus correction should be corrected by the auto-guiding function before it becomes visible. 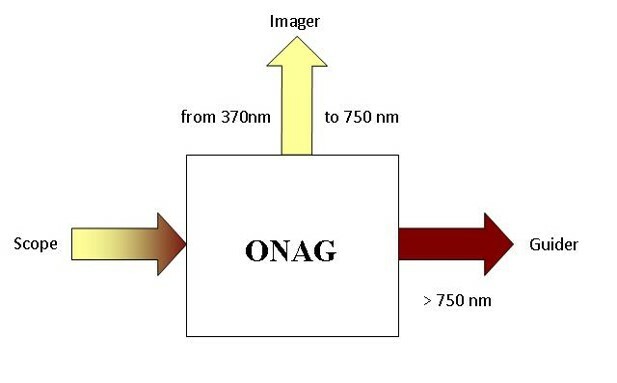 SharpLock is based on ONAG® technology. 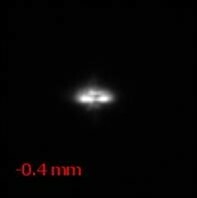 Near infrared light (>750nm) used by the guider camera is transmitted through the ONAG® dichroic mirror (see the left figure below). 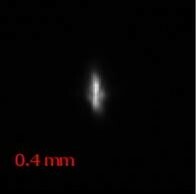 The mirror is set at an angle of 45 degrees for reflecting visible light (<750nm) toward the imaging camera. With this optical design, the guider camera is looking through a ‘tilted window’ and this causes a slight but useful distortion of the guide star image. 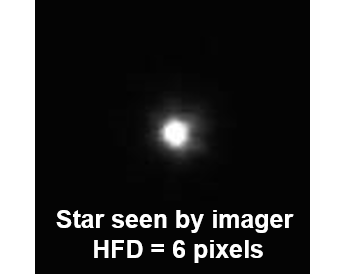 The left image below shows a typical guide star seen by the imaging camera (in visible light). Here there is no distortion since the light has been perfectly reflected. The right image shows the same star seen by the guider (in NIR). 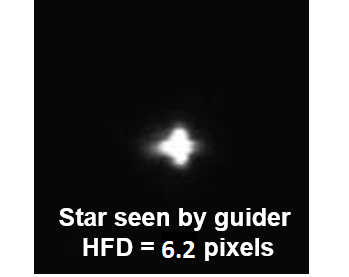 Although both have almost the same half flux diameter (HFD), which is essential all that matters from an auto-guiding point of view, the NIR guider image exhibits some degree of astigmatism. The guide star distortion does not impact auto-guiding algorithms, which typically use a centroid strategy, but this effect does provide an unique RTAF opportunity. 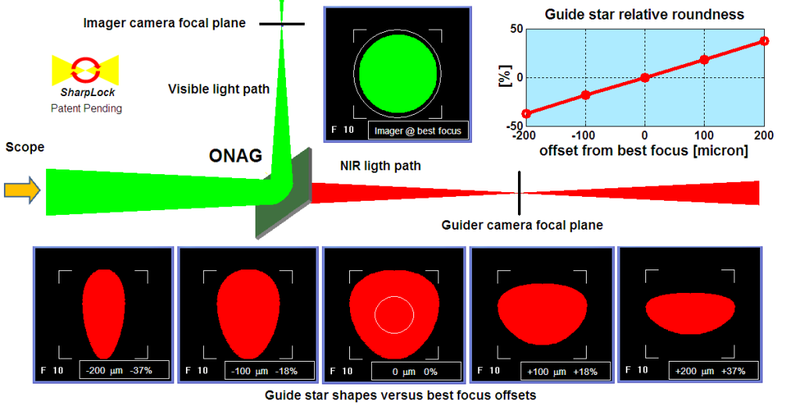 When the scope focus changes even a small amount (few microns), the guide star shape seen by the guider camera evolves in different ways depending of the direction of the focus motion (in or out). The next figure summarizes the SharpLock theory of operations. In this figure we can clearly see that temperature decreases (top plot in degree C), almost linearly over time (in minutes), the absolute position of the focuser (bottom plot in mm) needed to hold the best focus does not. At first, the focuser moved inward by about 170 microns in 12 minutes, then outward by 200 microns or so in 10 minutes, before eventually traveling inward again. Those values should be compared to the scope critical focus zone, which for F/8 is about +/-80 microns. Obviously without SharpLock frequent refocusing and imaging interruptions would have been required. The temperature dropped at a rate close to 3 degrees C per hour, which is fast enough to create such behavior. Modeling of this effect is very difficult and prevents a correction strategy based on predictive open loop techniques. SharpLock technology is able to evaluate actual images in real time and hold optimum focus by continuously compensating for changes. Your images will remain sharp frame after frame. Developed in partnership with Optec inc the new FocusLock software integrates our patent pending SharpLock Technology to provide an easy-to-use focusing application that functions whenever guiding is active. The ONAG cold-mirror introduces a slight astigmatism to the guide image allowing FocusLock to easly determine on which side of focus the camera is currently positioned. Using the proprietary SharpLock technology, FocusLock can be used to quickly drive the focuser to the optimal focus position and maintain focus for weeks or months at a time. FocusLock is the first method of focus that uses real-time feedback. Most methods of focus, including backlash compensation and temperature compensation, work by modeling the focus against a correlated physical parameter. These models can then be used to partially correct for changes in focus. However they cannot correct for any changes that fall outside their models. FocusLock uses a different approach. By introducing a slight astigmatism into the guide image FocusLock is able to detect drifts in focus in real time and correct for them. This means that the system will correct for any source of poor focus, even if that source has not been modeled. Classical focus strategies require imaging interruptions on the regular basis, like every 30′ or at any filter change. During the course of a night this could take away a lot of precious imaging time, not to mention potential issues due to the mount slewing back and forth, from the target to a reference star used for refocusing. The test below is a very interesting, side by side, comparison between the traditional method using “Focus Max” (FM) for periodic re-focusing and SharpLock without any interruption. 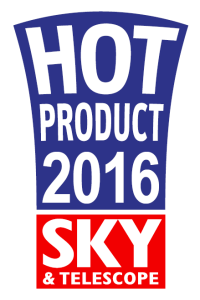 It was done using SharpLock using MaxIm-DL application together with CCD-autopilot (CCDAP). 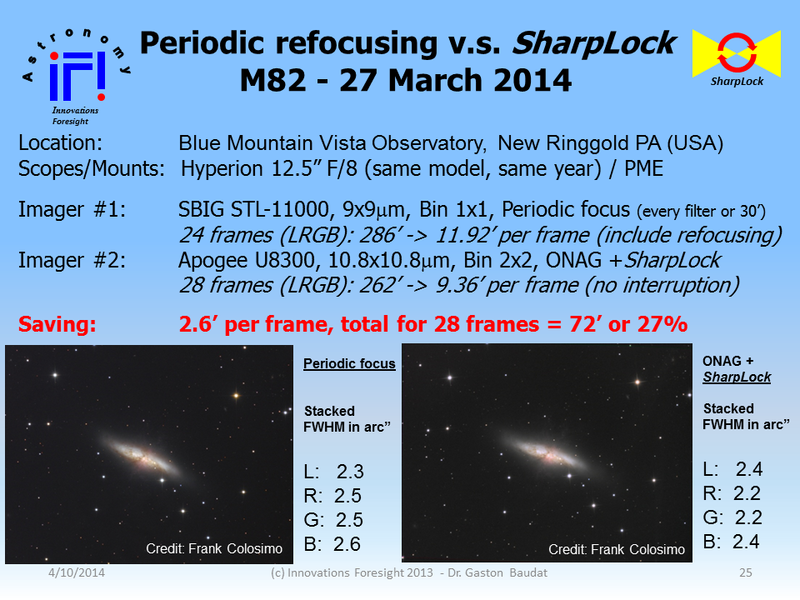 This comparison was made at the same location, at the same time, with two identical scopes (Hyperion 12.5 F/8) and mounts (PME), on the same target M82, credit Frank Colosimo (Blue Mountain Vista Observatory, New Ringgold PA, USA ). 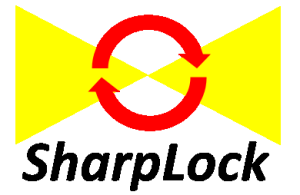 SharpLock saved 72 minutes of imaging time overall, or 27% of the session time. The image qualities were identical (same FWHMs) after stacking LRGB sub-exposures. With SharpLock there was no slew and target re-acquisitions, therefore no interruption of the imaging process. SharpLock gives you all your imaging time back and keeps all your frames sharp, whatever you run manual or remote operations. 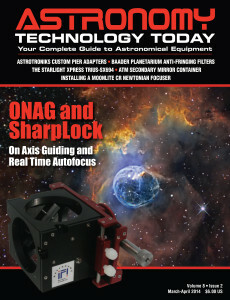 Read the Astronomy Technology Today magazine “ONAG and SharpLock, On Axis Guiding and Real Time Autofocus” article here. 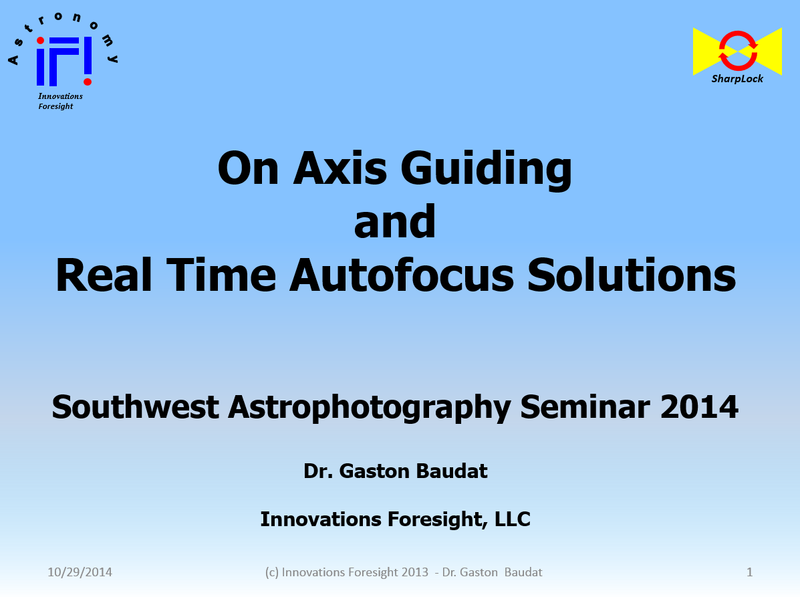 Read the Southwest Astrophotography Seminar 2014 “On Axis Guiding and Real Time Autofocus Solutions” presentation (slideshow) here.